What to do to keep you rabbit safe from harm, keep your house and belongings safe from bunny and try to maintain your sanity and sense of humor when bunny rabbit insists on going where no bunny belongs. One thing that happened due to an accident, turned out to be a lot simpler for us long run. 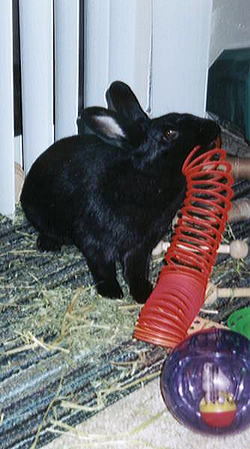 Tigger has always gnawed on her cage bars, even when the door was open and she was on the outside. One time as a baby, something spooked her and she pulled back without her teeth being free of the bars and injured her teeth and mouth. She lost the ability to use a water bottle with that injury. We switched her over to a heavy plastic water bowl that screwed on to the cage bars. After we got Tigger and Shadow together, he started using the bowl instead of his bottle and we just switched him over too. We also found plastic bowls that hook over the cage bars for a small amount of pellets. We discovered how much easier it is to clean the bowls compared to the water bottles. You can just pop them in the dishwasher along with everything else. We have two sets of water bowls and food bowls, one set is in the cages while the other is either in a cabinet ready to use or in the dishwasher being cleaned. When Tigger and Shadow are out for run time, we put down plastic plates for them of various greens. The plastic plates are inexpensive outdoor picnic style plates which due to Georgia’s warm climate are available in stores year round here: discount, food store, pretty much everywhere. These plates can also be put in the dishwasher. We have a set for them of about a half-dozen plates. Tigger likes to toss the plates if they are empty or the greens aren’t to her liking which gives a new bunny rabbit meaning to the term tossed salad. 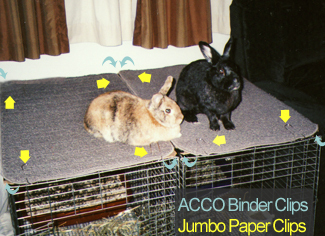 As promised yesterday, here are images of bungee cords and elastic alligator clips in use for bunnies. The last photo shows an outdoor resin storage bench that we had in the bunny room in our apartment. It stored stuff for them, but you can see they loved it too. We used some small rugs to make it a comfortable less slippery place for them to hang out. We held the rugs to the arm with elastic alligator sheet clips front and back and used giant metal paperclips to hold the arm rugs to the seat rug. The bench backed up against a window and the bunnies loved to wiggle through the holes in the bench onto the window ledge which we had to cover with cardboard to protect it from teething. They would often take naps in the afternoon on the bench or the window ledge. We had a second floor apartment. I wondered if anyone looking up and seeing animals sleeping in the window ever realized it was rabbits and not cats. I will have a follow friday suggestion later this evening. I can imagine the visual this title created. I am talking bungee cords for bunnies, but to keep things organized, not for bunny jumping stunts. I am also talking about bunnyproofing uses for the alligator clip elastic straps that are used to keep sheets in place on beds. This has been a crazy day, so I haven’t had a chance to get photos of these in action. I will post a couple of images tomorrow. I first saw these baby bungee cords in action at our first vets office. These are just 3″ and 6″ in length and they were using them to hook around water bottles and hold them to the cages. I never realized that the home improvement store carried ones so small! Most water bottles come with a metal hook to hold them to the cages, but I liked the idea of these bungee cords the minute I saw them. 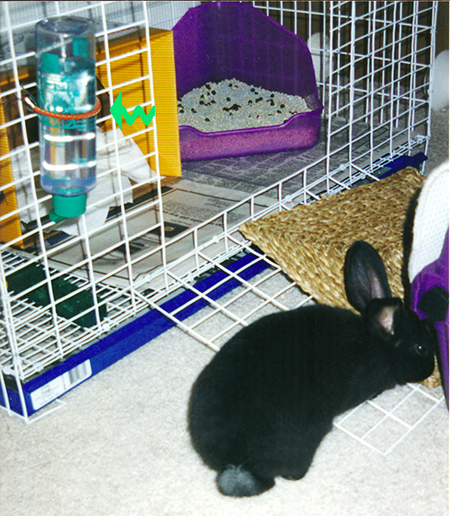 My family’s first bunny, Thumper, while in his cage would bounce his water bottle up and down until he unhooked the metal hook and his bottle would then fall off the cage. 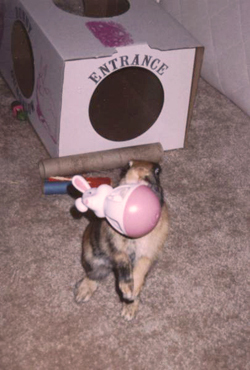 Fortunately for Thumper, someone was usually at home, otherwise he would have gone thirsty. So I loved the fact that the bungees would be something the bunnies could not disable while in their cages. The larger bungee / the elastic sheet alligator clips work well to hold plastic hay bins onto the cages. The little clip-on plastic pieces built onto those have never work right for us. The hay bins would constantly be falling off without these bungees / sheet clips. We have also used the sheet clips to hold some rugs in place on outdoor plastic furniture we had giving the bunnies a slip proof surface to hop up on. So anything you need to hold in place for the bunnies, these can help you out. They also serve as a chew toy for the bunnies from time to time. Occasionally one gets chewed through. It hasn’t happened too often though. I am assuming they got a bit of elastic snap that discouraged that particular chewing activity. This fix for us was a bit pricier than others, but was a must do. Even though litter box trained, Mr. Shadow decided he liked to sleep in his litter box and prefered to keep it dry. So he started aiming outside his cage. We were both working outside the home at the time and didn’t fully realize this until we went to do a thorough cleaning of the room and moved the cages. Even with cleaning, the carpet is badly stained and will have to be replaced. However, we found ourselves looking at a toss-up cost situation. Do we spend hundreds of dollars or more now to replace the carpet, or do we do something to protect it from further damage at this point? In a tough economy, we opted for cleaning the carpet the best we could and then putting down a couple chairmats designed for carpeting under desks in offices. It was a bit pricier than some of the other fixes we have done for bunnies, but a lot less expensive than replacing the floor at this point. This was a costly learning lesson. If we had put the chairmats down right from the start, the carpet would have been protected and our only cost would have been the chairmats. So, this one I pass along as one from the learn from our mistake category. If you need to have rabbit cages in a room with wall-to-wall carpeting, even if the rabbits are litter box trained, they may spray. So it is good to have something down under the cage to protect the carpet. These chairmats are designed for carpet to help protect the pile of carpeting from being permanently crushed. One negative is the price of them. You can get them in a number of rectangle sizes. We liked the ones that are a true rectangle, but price in our area ran $50 for one in the length we needed for the area and then we needed one for under each cage to get the full width. The second negative is that brand new these have a high odor. So we needed to put them in the garage until they lost the smell so so that we would not be causing breathing problems for either the rabbits or ourselves. A positive now is that since these are really heavy-duty plastic, they are too hard for the rabbits to chew up or destroy. Also, they can be swept or wiped clean quite easily. I wish we had planned to have these right from the start, so that they were aired out and ready to go down right when we first moved into the house. Tigger made it quite clear as a baby that she intended to hop up on top of her cage. She would sit up on her hind legs as far as she could trying to see the top, which wasn’t at all possible since she was just two pounds and the cage top was 18 inches high. However, we knew Tigger, whether she could see it or not, she was going to go there. 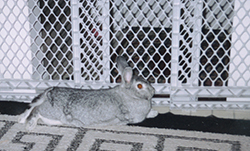 That presented a problem, because the spacing of the bars on the cage top was too wide for even a full-grown small rabbit to safely land, let alone a baby. We needed to do something fast to make it safe for whenever Tigger decided to make the leap. At first we took a piece of cardboard cut to the size of the cage top and used ACCO binder clips to fasten the cardboard at the four corners to the top bars of the cage. Tigger made a safe but very slippery landing her first time hopping up there. So I hit the discount stores and found a small throw rug exactly the size needed. If I hadn’t, I would have cut a carpet remnant to size. We put the carpet on top of the cardboard and used giant 4″ metal paper clips to clip the carpet to the cardboard at the four corners. That was a complete success on several fronts. It made the cage top safe for Tigger to hop up. 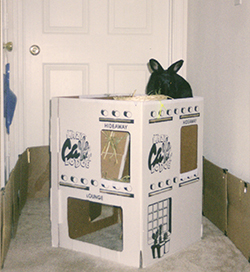 Then when Shadow joined us two months later with his own cage, we fixed his the same. Since he could see her hopping up on top while she would free roam, he learned even more quickly than she did to hop up on top. They were kept safe from harm and it gave them an added space that they love, a bunny rabbit high ground to survey their territory. 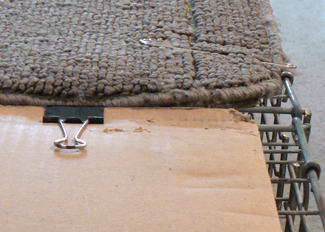 Since the cardboard and carpet are clipped on, it is very easy to take apart to clean cages, the carpets or replace the cardboard. 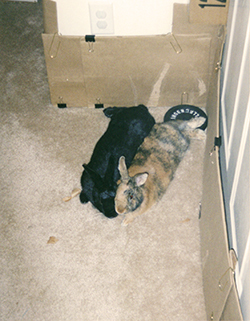 When they were younger they would just hop straight up and down from the cage top. Now that they have become senior buns that is a little bit too high. The cages are pushed up against a loveseat and the seat there is a few inches lower than their cage tops. So now they hop up on the loveseat and then hop over to the cage tops. In the future we may need to look at some pet steps if the loveseat begins to be too high. For now everyone is happy with the bunny high ground. This post is about hitting the office products department to help with bunnyproofing and make your life with rabbits simpler. Both clips in the picture are 1 1/4 inches wide. 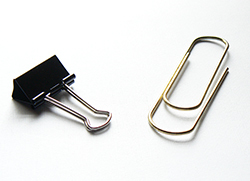 The black ACCO binder clip is 2 inches long while the giant paper clip is 4 inches long. How do we use these? These clips are great for holding cardboard together to make replaceable walls to keep bunny away from baseboards, furniture or doors you don’t want chewed. To see cardboard walls and pictures we created, here is a link back to an article I wrote at the end of June, The Great Wall of Cardboard. A little bit later today, I will post some pictures showing how we used these clips, cardboard and carpet to both protect the bunnies and create a fun place to hang out. Everybody Out of the Poo! Blaine has actually said that to the rabbits numerous times. It is amazing how territorial rabbits are about their poo. When we bring new litter boxes out and start to try to take the old ones away, we always end up with a bunny in the dirty box. The message is pretty apparent, “That is mine, where do you think you are going with it!” As they roam around, if they spot a lone poop on the floor, they always stop to smell it. I don’t know who’s they imagine it is going to turn out to be, but they always double-check. After we brought Tigger and Shadow home, I did a lot of internet research on rabbits to try to find info to best help me with bunnyproofing. I learned that a certain amount of poop outside the box isn’t accidental, but intentional marking of territory. We have certainly seen that over the years. They love to poop a perimeter around the litter boxes that are in the living room. We keep scooping it in and telling them over and over that they don’t need to mark the boxes as theirs, no one else is going to claim them or use them. The rabbits are probably not buying that one since we keep switching the boxes out for new ones that don’t have that eau d’bunny smell or the artistically placed poo markers. I am certain little bunny minds are saying we steal their stuff. Ah well, there is another aspect of the rabbit territorial marking I wish we had given a bit more thought to in regards to the placement of their boxes in their current living space. When we first got Tigger & Shadow, we were living in an apartment. The room layouts allowed us to dedicate the smallest bedroom as theirs. Cages, food, toys and outdoor furniture for us to sit on was all kept in the room. The bunnies could play and mess it up. Like kids rooms, we could close the door on them if we got unexpected company. We didn’t do a lot of thinking or planning on where the litter boxes needed to be, they just needed to be in that room. When we moved to our house, the layout and room sizes were quite different. We weren’t able to give the bunnies their own room and didn’t have a basement, family room, sun room or room off the main drag. The house layout is quite open. So there wasn’t a way to give them privacy or easily hide their worst messes either. The only space we had large enough for their cages was in the living room. To give them a bit more privacy, we put their cages at the back of the room. Now one recommendation for optimal litter box training is that you let the rabbit decide where they want the box. We knew in the new home there would be some sorting out until we got them settled in and had their boxes where they were happiest with them. Our cage placement turned out to have unintended consequences as to where the bunnies chose as their spot for their litter boxes. Logically if we had thought it out at all, we would probably have realized they would pick the farthest place from their cage on the other side of their territory. Which is what they did, but it was a slow adjusting training process of us by the bunnies getting us to keep moving the boxes to follow the poo and pee trail until the boxes reached their ultimate prefered spot. Now Tigger & Shadow have the boxes right where they want them, on the floor in front of the TV, the first thing you see on the right when you walk in the front door of our home. I think we should have put their cages out in the open so that we could have hidden the litter boxes at the back of the room. Ah well, always living and learning with the bunnies. We came up with the acronym B.A.D.D. (aka BADD) for Bunny Attention Deficit Disorder. Shadow can be a very destructive bunny when he gets his little rabbit mind focused on chewing something up. He also has the attention span of a gnat if something else catches his eye. We kept saying he had ADD, then bunny ADD and eventually realized BADD really covered it quite nicely. 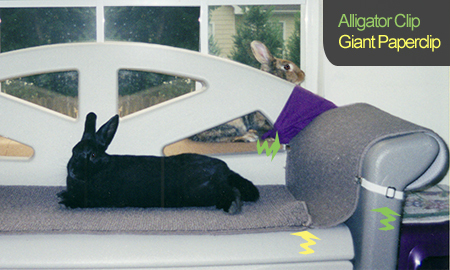 The ADD nature of some rabbits can be used to your advantage in bunnyproofing by realizing that relocation of a BADD rabbit can short-circuit and reroute destructive activities to acceptable ones. I quite regularly pick Shadow up and relocate him to an entirely different part of the house and give him something acceptable to chew up or play with. That does put more effort on me on some days when he seems to be extremely focused on a destructive activity and keeps stubbornly coming back to it. I may have to go pick him up and relocate him several times. Shadow is a bright boy though and doesn’t want to keep being picked up. He will get the idea after a couple times and then when he sees me coming to check on him, he will relocate himself. They key to making this work is having acceptable things to chew available in different locations around your home. That way you can relocate a rabbit from one area to another and quickly interest them in something else they are supposed to chew or play with. Shadow loves cardboard. So we have stashes of cardboard tubes from paper towels and cardboard tunnels or boxes in different locations as well as grass mats and willow chews in various locations. Think of your house in terms of different zones, perhaps by room or floor. Place good bunny things to chew or play with in each zone so that you can try relocation and refocusing as a tactic for a misbehaving rabbit. Well, I had some technical issues today getting the scanner to play nice with me over these photos. Going forward I am trying to find a better way to get the old 35mm film shots of Tigger and Shadow converted to digital. When we first got Tigger and Shadow, we were living in an apartment. Right off the bat, we realized that their fearsome tendency to chew everything they could was going to put our pet and regular security deposit in huge jeopardy if we didn’t do something major to keep bunny teeth away from baseboards, doors and plaster walls. So we ended up creating the Great Wall of Cardboard. You can see it running around the rooms in these pictures. We used either pieces of cardboard or cardboard mailing envelopes and hooked them together with ACCO binder clips at the top and bottom or large 3″ metal paper clips. We liked the cardboard mailing envelopes because they were not only a uniform size, but there were two thicknesses for the rabbits to have to chew through before they could get to baseboards, doors or plaster. The clips holding the cardboard together allowed it to be taken down and put up easily if we wanted to completely disassemble it for company coming. It was also easy to replace pieces of the cardboard wall as they became too chewed. The wall was a foot tall, so we could easily open a door and step over it into another room. Unless a bunny was right there and ready to leap, it stopped them from zooming through. The Great Wall of Cardboard served us well and when we moved out, we did get our security deposit back. 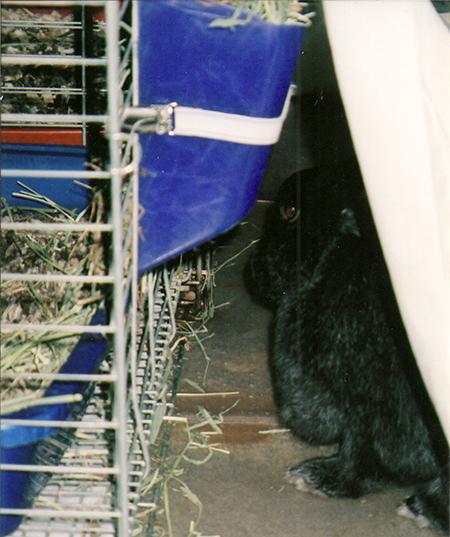 We thought when we brought Shadow home two months after Tigger that we had done all the bunnyproofing necessary and were fully prepared for the new bunny. He proved us wrong really fast. Shadow was quick to catch on to using the litter pan, but added a new twist to it. He would hop in, use the litter pan and then dig it out. His excavation skills were exceptional. We would find ourselves with a huge pile of litter on the floor everyday. We would scoop it back in and he would dig it back out. We went out and got some litter boxes with tops and found ourselves with a whole new set of bunnyproofing needs. Tigger and Shadow were still just a few months old and pretty small at under four pounds each. We had to buy plastic stools for children so they could hop in and out of the boxes. Then we had to put carpeting on top of the boxes when they started to hop on top so that they wouldn’t go sliding right off the slippery plastic. At one point we solved that problem by buying covered litter boxes that had round domed tops. They couldn’t hop on those. Shadow continued to dig, but the small size of the door kept down the level of the mess. We thought we had our excavator under control. When they got to full adult size, we were able to get rid of the stools. Things went well for a number of years, then a few years ago, we noticed that they were sometimes not hopping into the boxes but going beside them. We realized that as they aged perhaps hopping up and in was getting harder. So we invested in some litter pans designed for puppies that have a lowered edge on one side. Tigger and Shadow seemed to really appreciate the ease of getting into and out of these. Shadow really appreciated the ease of digging out these new pans and went back to excavating full force. I headed back to the stores to try to figure out a work around. I discovered some large flat boot trays that turned out to be just the right size to put one on each side of the litter pans and one in front of them. Now Shadow digs out into the boot tray and we can dump it easily back into the litter pan. However, we do have to watch to make sure that the little stinker doesn’t try to dig out the boot tray too before we can dump it back in. Our biggest regret is that we haven’t ever had a place to put a sandbox. Our little digger would probably think he was in bunny heaven if we could give him a real digging outlet. We do make him very happy when we give him a pile of shredded paper to go burrowing in and he does love to dig underneath the hay pile in the hay bin. He comes up covered in paper or hay and if he takes off running, the mess goes with him. 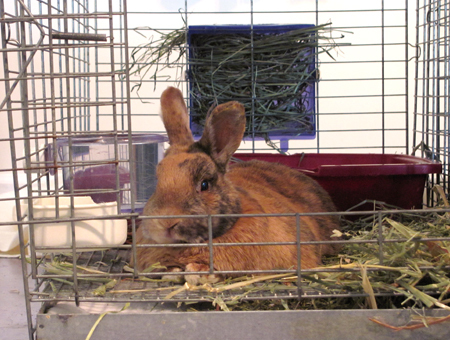 Even if you intend for your rabbit to be mostly or completely free ranging, a cage or enclosure will give your bunny a place they recognize as theirs. This can add to feelings of security. They do like to have a place to use as their home base where food, water and some toys are located and where they can retreat for privacy. I know many have a cage that a bunny can call its own even if the door is never locked on the rabbit. Things to consider in making the free range vs. cage decision: Discussions in bunny circles and groups can get heated about caging or penning rabbits as opposed to allowing them to be free roaming house rabbits. Our rabbits don’t seem to understand the principles of gravity and don’t realize the danger of a tummy full of carpet. Their free area and time are restricted by their inability to be trusted when we aren’t around to watch and prevent their stupid rabbit stunts. So, don’t feel guilty if you have to set limits to keep your bunny safe and healthy. 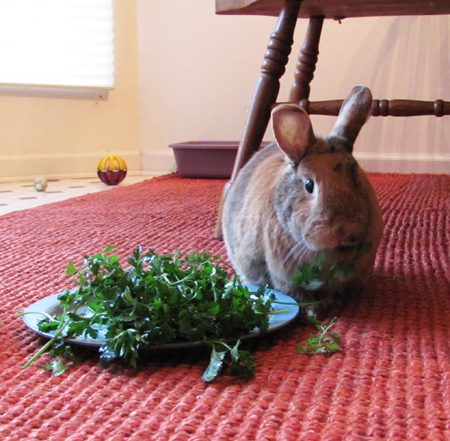 We would not have 10-year-old rabbits if we had allowed them to roam freely 24/7 and chew indiscriminately. Some rabbits need the safety of one well bunnyproofed room, a large cage or exercise pen when someone isn’t available to watch them. Just be sure to allow the adventurous bunny to have plenty of free roam time when you are available. A minimum of 30 hours a week of free exercise time with a number of hours each day out is best for bunny rabbit well-being. Also be sure that any cage or enclosure is large enough to allow them room to move and run a bit and be able to stand up to their full height comfortably. There should be room for a litter box, and containers for their food, hay and water. Give them some toys to play with or chew too. You can buy a cage or animal exercise pen or bunnyproof a small room or use a baby gate to isolate an area. It all depends on your rabbit. Tigger and Shadow have always had cages with four walls, because those are the only things that would contain them. Portia who did not leap, had a 3 foot tall open-topped exercise pen. When the three would run free, we would have a baby gate blocking the bottom of the stairs in Portia’s area and a 4 foot tall exercise pen blocking the top of the stairs in Tigger and Shadow’s area. We needed to make the stairs a no bunny zone with double gates at each end to keep the three apart. 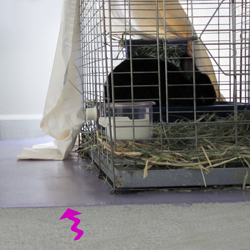 Next week on Wednesday, I will share how to make bunnyproofing fun!